Bashundhara City Development Limited (BCDL), on behalf of Bashundhara Group, has donated a Mahindra Bolero car to Tejgaon police station under Dhaka Metropolitan Police. TIM Latiful Husain, Senior Adviser (Tech.) to the Chairman of Bashundhara Group, handed over the car to Opurbo Hasan, officer-in-charge of Tejgaon police station, on Saturday at a function held at the administrative office of BCDL. “Everyday lots of tourists visit Bashundhara City and this is why the government has always given importance to Bashundhara City,” he said. “Bashundhara City is an attractive place as well as a popular shopping mall. We are always working to improve the facility and security of Bashundhara City”, he added. 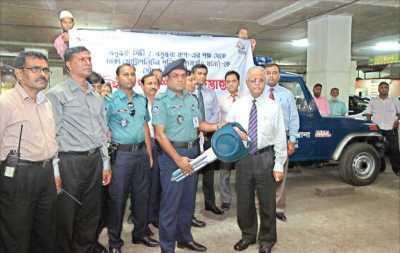 Opurbo Hasan thanked Bashundhara Group for the kind gesture, saying, “For lack of vehicle we are facing problem to patrol the Bashundhara City area. Now we can patrol the area without hassle”. Sheikh Abdul Alim, senior ED (Accounts and Finance) of BCDL, Captain SM Masud Parvej Dipu, GM (Administration and Security) of BCDL, and police officials were present on the occasion.